The Pentagon has decided not to disclose the current number of nuclear weapons in the Defense Department’s nuclear weapons stockpile. The decision, which came as a denial of a request from FAS’s Steven Aftergood for declassification of the 2018 nuclear weapons stockpile number, reverses the U.S. practice from the past nine years and represents an unnecessary and counterproductive reversal of nuclear policy. The United States in 2010 for the first time declassified the entire history of its nuclear weapons stockpile size, a decision that has since been used by officials to support U.S. non-proliferation policy by demonstrating U.S. adherence to the nuclear Non-Proliferation Treaty (NPT), providing transparency about U.S. nuclear weapons policy, counter false rumors about secretly building up its nuclear arsenal, and to encourage other nuclear-armed states to be more transparent about their arsenals. Importantly, the U.S. also disclosed the number of warheads dismantled each year back to 1994. This disclosure helped document that the United States was not hiding retired weapons but actually dismantling them. In 2014, the United States even declassified the total inventory of retired warheads still awaiting dismantlement at that time: 2,500. 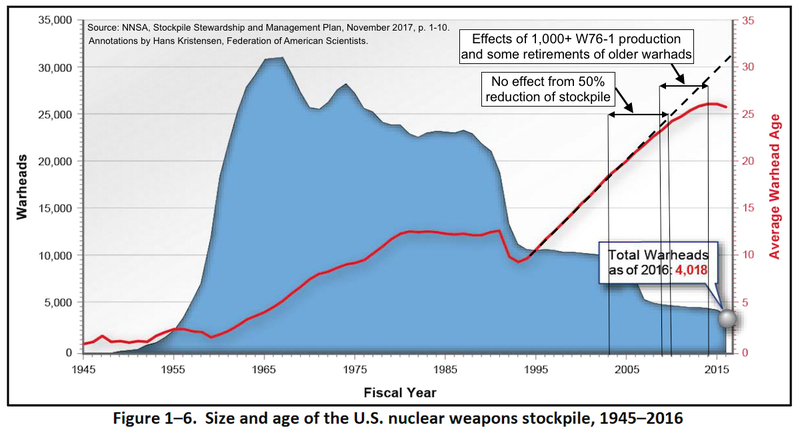 The 2010 release built on previous disclosures, most importantly the Department of Energy’s declassification decisions in 1996, which included – among other issues – a table of nuclear weapons stockpile data with information about stockpile numbers, megatonnage, builds, retirements, and disassemblies between 1945 and 1994. Unfortunately, the web site is poorly maintained and the original page headlined “Declassification of Certain Characteristics of the United States Nuclear Weapon Stockpile” no longer has tables, another page is corrupted, but the raw data is still available here. Clearly, DOE should fix the site. The decision in 2010 to disclose the size of the stockpile and the dismantlement numbers did not mean the numbers would necessarily be updated each subsequent year. Each year was a separate declassification decision that was announced on the DOD Open Government web site. The most recent decision from 2018 in response to a request from FAS showed the stockpile number as of September 2017: 3,822 stockpiled warheads and 354 dismantled warheads. The 2017 number was extra good news because it showed the Trump administration, despite bombastic rhetoric from the president, had continued to reduce the size of the stockpile (see my analysis from 2018). Since 2010, Britain and France have both followed the U.S. example by providing additional information about the size of their arsenals, although they have yet to disclose the entire history of their warhead inventories. Russia, China, India, Pakistan, Israel, and North Korea have not yet provided information about the size or history of their arsenals. The Federation of American Scientists (FAS) has been tracking nuclear arsenals for many years, previously in collaboration with the Natural Resources Defense Council (NRDC). The 5,113-warhead stockpile number declassified by the Obama administration in 2010 was only 13 warheads off the FAS/NRDC estimate at the time. We provide these estimates on our web site, on our Strategic Security Blog, and in publications such as the bi-monthly Nuclear Notebook published in the Bulletin of the Atomic Scientists and the annual nuclear forces chapter in the SIPRI Yearbook. The work is used extensively by journalists, NGOs, scholars, parliamentarians, and government officials. With the Pentagon decision to close the books on the stockpile, and the rampant nuclear modernization underway worldwide, the role of FAS and others in documenting the status of nuclear forces will be even more important. The Pentagon’s decision not to disclose the 2018 nuclear weapons stockpiled and dismantled warhead numbers is unnecessary and counterproductive. The United States or its allies are not suffering or at a disadvantage because the nuclear stockpile numbers are in the public. Indeed, there seems to be no rational national security factor that justifies the decision to reinstate nuclear stockpile secrecy. The decision walks back nearly a decade of U.S. nuclear weapons transparency policy – in fact, longer if including stockpile transparency initiatives in the late-1990s – and places the United States is the same box as over-secretive nuclear-armed states, several of which are U.S. adversaries. The decision also puts the United States in an even more disadvantageous position for next year’s nuclear Non-Proliferation Treaty (NPT) review conference where the administration will be unable to report progress on meeting its Article VI obligations. Instead, this decision, as well as decisions to withdraw from the INF treaty, start producing new nuclear weapons, and the absence of nuclear arms control negotiations, needlessly open up the United States to criticism from other Parties to the NPT – a treaty the United States needs to protect and strengthen to curtail nuclear proliferation. The decision also puts U.S. allies like Britain and France in the awkward position of having to reconsider their nuclear transparency policies as well or be seen to be out of sync with their largest military ally at a time of increased East-West hostilities. With this decision, the Trump administration surrenders any pressure on other nuclear-armed states to be more transparent about the size of their nuclear weapon stockpiles. This is curious since the Trump administration had repeatedly complained about secrecy in the Russian and Chinese arsenals. Instead, it now appears to endorse their secrecy. The decision will undoubtedly fuel suspicion and worst-case mindsets in adversarial countries. Russia will now likely argue that not only has the United States obscured conversion of nuclear launchers under the New START treaty, it has now decided also to keep secret the number of nuclear warheads it has available for them. Finally, the decision also makes it harder to envision achieving new arms control agreements with Russia and China to curtail their nuclear arsenals. After all, if the United States is not willing to maintain transparency of its warhead inventory, why should they disclose theirs? Is it because the chaos and incompetence in the Trump administration have enabled hardliners and secrecy zealots to reverse a policy they disagreed with anyway? Is it a result of the Nuclear Posture Review’s embrace of Great Power Competition with Cold War-like instincts to increase reliance on nuclear weapons, kill arms control treaties, increase secrecy, and scuttle policies that some say appease adversaries? Is it because of a Trump administration mindset opposing anything created by president Obama? The answer may be as simple as “because it can” with no opposition from the White House. Whatever the reason, the decision to reinstate stockpile secrecy caps a startling and rapid transformation of U.S. nuclear policy. Within just a little over two years, the United States under the chaotic and disastrous policies of the Trump administration has gone from promoting nuclear transparency, arms control, and nuclear constraint to increasing nuclear secrecy, abandoning arms control agreements, producing new nuclear weapons, and increasing reliance on such weapons in the name of Great Power Competition. This is a historic policy reversal by any standard and one that demands the utmost effort on the part of Congress and the 2020 presidential election candidates to prevent the United States from essentially going nuclear rogue but return it to a more constructive nuclear weapons policy. This publication was made possible by generous contributions from the Carnegie Corporation of New York, the John D. and Catherine T. MacArthur Foundation, the New Land Foundation, the Ploughshares Fund, and the Prospect Hill Foundation. The statements made and views expressed are solely the responsibility of the authors. 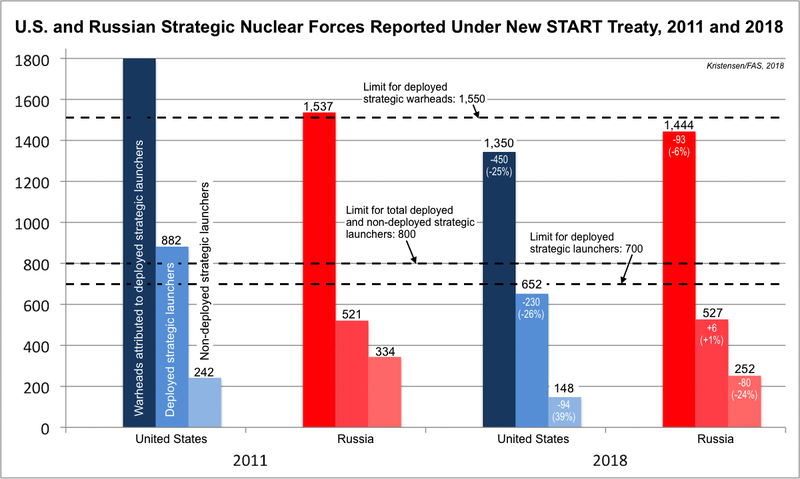 By Hans M. Kristensen The latest set of New START treaty aggregate data released by the US State Department shows Russia and the United States continue to abide by the limitations of the New START treaty. The data shows that Russia and the United States combined have cut a total of 429 strategic launchers since February 2011, reduced the number of deployed launchers by 223, and reduced the number of warheads attributed to those launchers by 511. The good news comes despite efforts by officials in Moscow and Washington to create doubts about the value of New START by complaining about lack of irreversibility, weapon systems not covered by the treaty, or other unrelated treaty compliance and behavioral matters. These complaints are part of the ongoing bickering between Russia and the United States and appear intended – they certainly have that effect – to create doubt about the value of extending New START for five years beyond 2021. Playing politics with New START is irresponsible and counterproductive. While the treaty has facilitated coordinated and verifiable reductions and provides for on-site inspections and a continuous exchange of notifications about strategic offensive nuclear forces, the remaining arsenals are large, undergoing extensive modernized, and demand continued limits and verification. By the Numbers The latest New START data shows that the United States and Russia combined, as of March 1st, 2019, deployed a total of 1,180 strategic launchers (long-range ballistic missiles and heavy bombers) with a total of 2,826 warheads attributed to them (see chart below). These two arsenals constitute more strategic launchers and warheads than all the world’s other seven nuclear-armed states possess combined. For Russia, the data shows 524 deployed strategic launchers with 1,461 warheads. That’s a slight increase of 7 launchers and 41 warheads compared with September 2018. Russia is currently 176 launchers and 89 warheads below the treaty limit for deployed strategic weapons. The United States deploys 656 strategic launchers with 1,365 warheads attributed to them, or a slight decrease of 3 launchers and 33 warheads compared with September 2018. The United States is currently 44 launchers and 185 warheads below the treaty limit for deployed strategic weapons. These increases and decreases since September 2018 are normal fluctuations in the arsenals due to maintenance and upgrades and do not reflect an increase or decrease of the threat level. It is important to remind, that the Russian and US nuclear forces reported under New START are only a portion of their total stockpiles of nuclear weapons, currently estimated at 4,350 for Russia and 3,800 for the United States (6,850 and 6,460, respectively, if also counting retired warheads awaiting dismantlement). Build-Up, What Build-Up Despite frequent claims by some about a Russian nuclear “buildup,” the New START data does not show such a development. On the contrary, it shows that Russia’s strategic offensive nuclear force level – despite ongoing modernization – is relatively steady. Deteriorating relations have so far not caused Russia (or the United States) to increase strategic force levels or slowed down the reductions required by New START. On the contrary, both sides seem to be continuing to structure their central strategic nuclear forces in accordance with the treaty’s limitations and intentions. That said, both countries are working on modifications to their strategic nuclear arsenals. Russia has been working for a long time – even before New START was signed – to develop exotic intercontinental-range weapons to overcome US ballistic missile defense systems. These exotic weapons, which are not deployed or covered by the treaty, include a ground-launched nuclear-powered cruise missile (Burevestnik) and a submarine-launched torpedo-like drone (Poseidon). An ICBM-launched glide-vehicle commonly known as Avangard is close to initial deployment but would likely supplement the current ICBM force rather than increasing it. The new weapons are limited in numbers and insufficient to change the overall strategic balance or challenge extension of New START. The treaty provides for adding new weapon types if agreed by the two parties, although neither side has formally proposed to do so. Russia is not at an advantage in terms of overall strategic nuclear forces, nor does it appear to try to close the significant gap the New START data shows exists in the number of strategic launchers – 132 in US favor by the latest count. To put things in perspective, 132 launchers is nearly the equivalent of a US ICBM wing, more than six Ohio-class ballistic missile submarines, or twice the size of the entire US nuclear bomber fleet. If the tables were turned, US officials and hardliners would be screaming about a disadvantage. Astoundingly, some are still trying to make that case despite the US advantage. Given the launcher asymmetry, one could also suspect that Russia might seek to retain more non-deployed launchers for potential redeployment to be able to rapidly increase the force if necessary. Instead, the New START data shows that Russia has continued to decrease its non-deployed launchers by 185 since the peak of 421 in 2013. Russian strategic modernization has been slower than expected with delays and less elaborate base upgrades and is stymied by a weak economy and corruption in government and defense industry. Russia is compensating for this asymmetry by maximizing warhead loadings on its new missiles, but the New START data indicates that Russia since 2016 has been forced to reduce the normal warhead loading on some of its ballistic missiles in order to meet the treaty limit for deployed warheads. This demonstrates New START has a real constraining effect on Russian strategic forces. Having said that, Russia could – like the United States – upload large numbers of non-deployed nuclear warheads onto deployed launchers if a decision was made to break out of the New START limits. Those launchers would include initially bombers, then sea-launched ballistic missiles, and in the longer term the ICBMs. The United States has dismantled and converted more launchers than Russia because the United States had more of them when the treaty was signed, not because Washington was handed a “bad deal,’ as some defense hardliners have claimed. But Russia has complained – including in an unprecedented letter to the US Congress – that it is unable to verify that launchers converted by the US can’t be returned to nuclear use. The New START treaty does not require irreversibility and the US insists conversions have been carried out as required by the treaty rules that Russia agreed to. Discussions continue in Bilateral Consultative Committee (BCC). Verification and Notifications Although not included in the formal aggregate data, the State Department has also disclosed the total number of inspections and notifications conducted under the treaty. Since February 2011, this has included 294 onsite inspections (3 each since September) and 17,516 notifications (up about 1,100 since September 2018). This data flow is essential to providing confidence and reassurance that the strategic force level of the other side indeed is what they say it is. It also provides each side invaluable insight into structural and operational matters that complements and expands what is possible to ascertain with national technical means. US SSBN in drydock. Russia says it cannot verify conversion of US strategic launchers. Click on image to see full size. 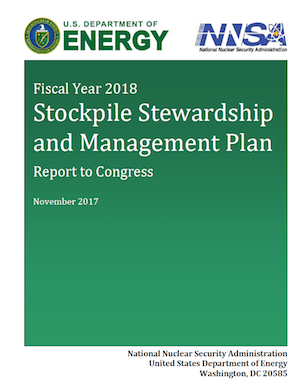 NNSA has published the Stockpile Stewardship and Management Plan for Fiscal Year 2019, which updates the agency’s work on producing and maintaining the U.S. stockpile of nuclear warheads. The latest plan follows the broad outlines of last year’s plan but contains important changes. The new plan shows significant cost increases and warhead production plans that appear to collide with the fiscal realities facing the Nation in the years ahead. The FY2019 SSMP shows significant increases in out-year cost estimates. The “bow wave” of increased costs in the early-2020s that triggered concerns about affordability appears to have become “a flooding” and continue in subsequent years. The cost-drop the previous SSMP projected for the mid-2020s appears not to be happening. 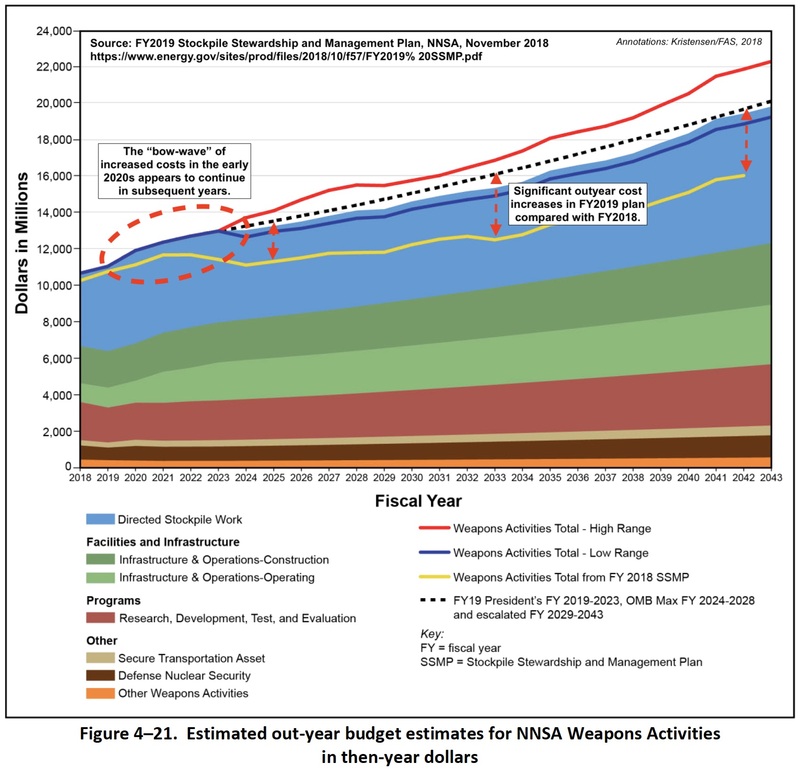 Over the next 25 years, NNSA’s spending on nuclear weapons activities is projected to double (see figure below). Moreover, the addition of a new SLCM not included in the current plan will further increase costs over the next decade-plus. 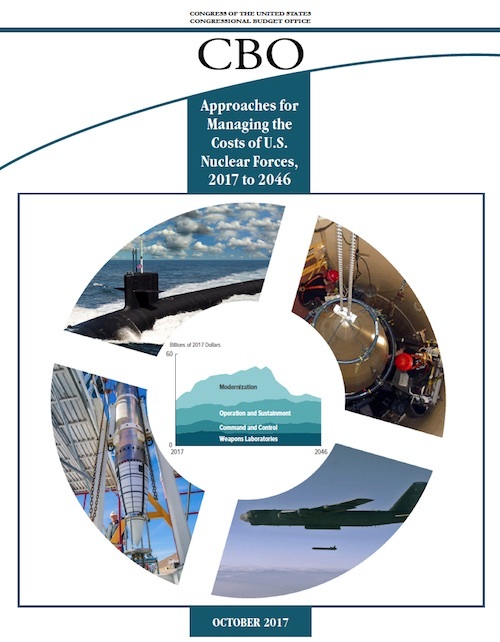 Part of the greater cost comes from increases in the cost estimates for the individual warhead live-extension programs (LEPs). 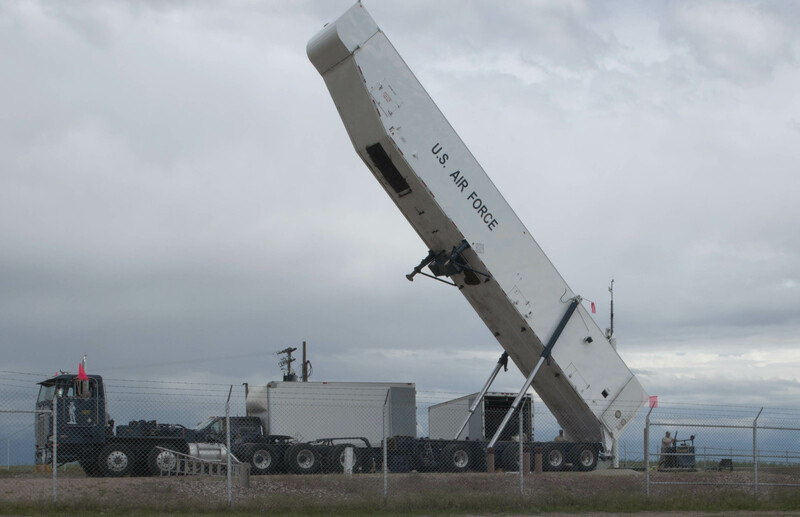 The W78 LEP, one of the two warheads on the Minuteman III ICBM, is now projected to cost $15.4 billion, up 3.3% from $14.9 billion in the previous plan. The high estimate has even greater increase: up from $18.6 billion to $19.5 billion. Moreover, this cost estimate does not include the incremental cost to get to a 30-pit-per-year plutonium capability by FY 2026 to support this LEP. All of the other warhead programs also have cost increases. In the near-term, these developments result in immediate cost increases and exacerbate the cost “bow wave” in the first half of the 2020s, which shows an increase of several hundred million dollars each year. Total annual LEP costs are lower in the following decade but that reduction would likely be more than erased by expected cost increases and a decision to move forward with development and production of a SLCM as recommended by the Trump administration’s Nuclear Posture Review (see figure below). 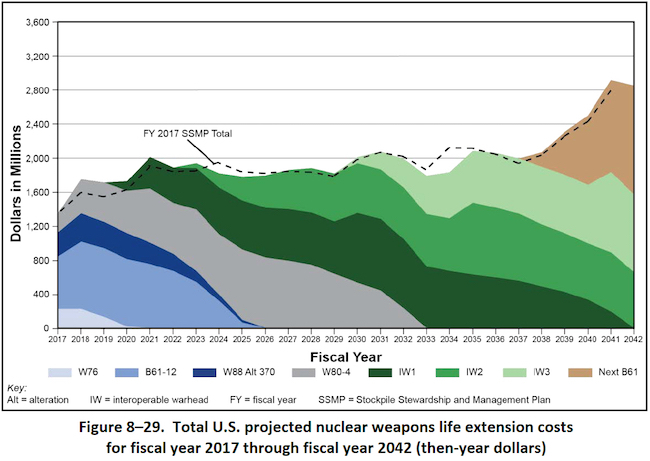 The FY2019 SSMP includes several graphs that expand transparency of the nuclear warhead work now and for the next several decades. 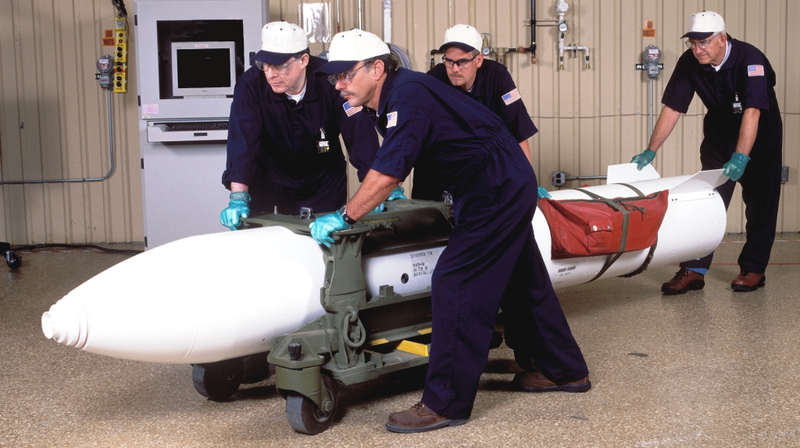 Most significantly, the SSMP expands information about sustainment work on legacy warheads (those warheads that are already in the stockpile) by breaking it down by work on limited life components (LLCs) such as neutron generators and gas transfer systems, alterations, surety upgrades, and joint test assemblies (JCSs) used for text flights. Overall, this transparency improves overview of the total workload facing the nuclear enterprise. 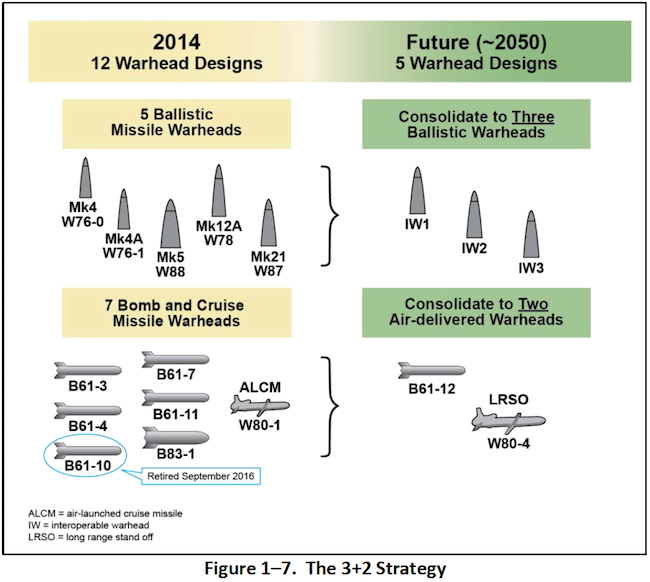 Interestingly, the so-called “3+2 warhead strategy” that was highlighted in the previous SSMP and congressional hearings as the only way forward is not mentioned in the new plan at all. The intension was to build three interoperable warheads (IWs) for ICBMs and SLBMs and two warheads for aircraft. IW1, which was previously described as a combination of W78 and W88-1, is now simply referred to as the W78 Replacement Program. The two other IWs – the IW2 combining W87 and W88, and the IW3 involving the W76-1 – are now listed with new names: BM-Y and BM-Z. In the graph below, I have combined the SSMP graphs of warhead LEPs and legacy warhead work into one graph and marked changes and omissions compared with the previous SSMP. 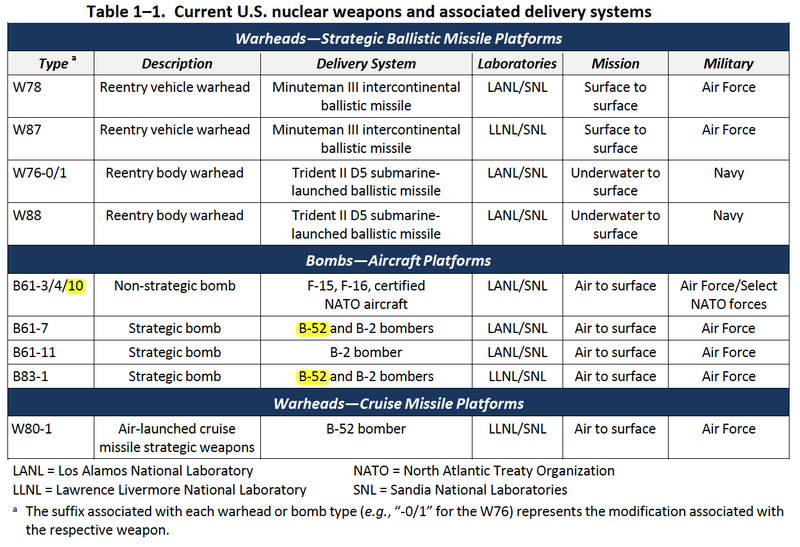 The new plan includes two new warheads: the low-yield W76-2 and the SLCM. The LEP section shows W76-2 work stretching out five years from mid-FY2019 (after completion of the current W76-1 LEP) through much of FY2024 (although work might actually be happening one year earlier). The W76-2 is intended to be deployed on SSBNs along with higher-yield W76-1 and W88 warheads. The W76-2 is intended for use in limited “tactical” scenarios in response to for example Russian use of tactical nuclear weapons. It might also serve a role in the expanded nuclear first-use options against “non-nuclear strategic attack” described in the NPR. The SLCM is mentioned in the SSMP but with no details about the development and production timeline. NNSA says the SLCM “will be a major new addition in the next decade.” In the combined graph I have included a notional SLCM development and production line for illustrative purposes based on the LRSO timeline. It assumes initial startup in FY2020 after completion of an Analysis of Alternatives (AoA). 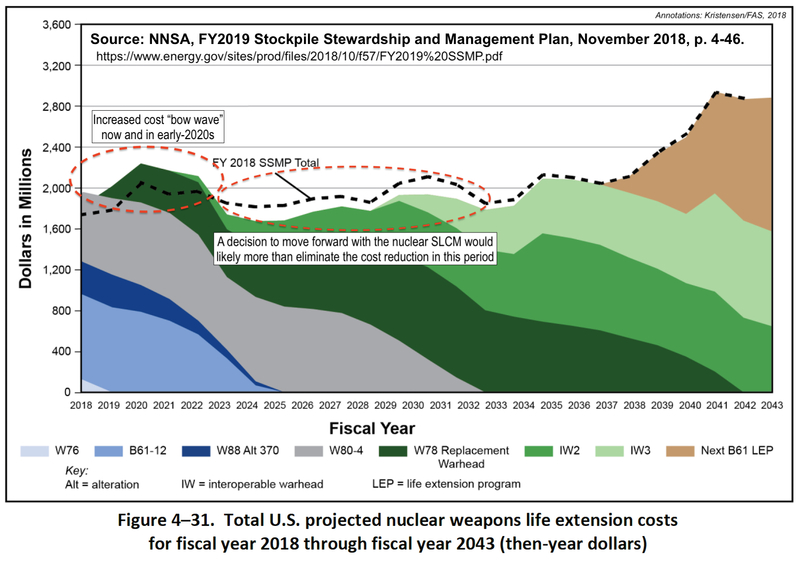 The SSMP LEP graph does not include the next B61 life extension program (previously called B61-13 in FY2016 SSMP version), which is scheduled to start in 2038. To correct that oversight, I have included it in the graph. 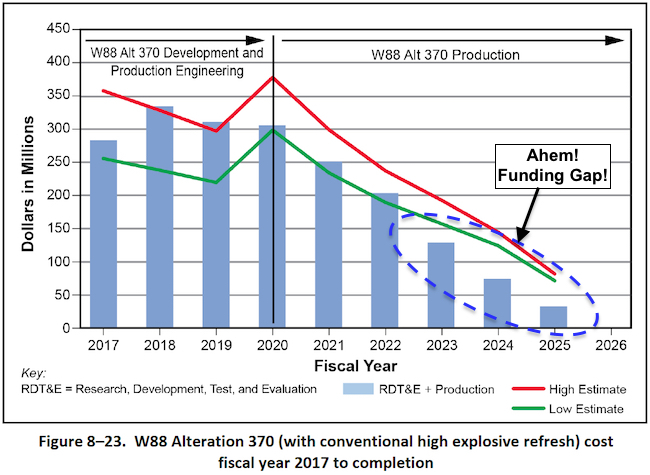 This is a major warhead upgrade with cost estimates in the early-2040s ($1.4 billion in 2043) that go beyond that of any other existing or projected LEP program. And based on the cost graph, annual costs estimates would be even greater after 2043. It is yet unclear why the next B61 LEP will be so expensive. 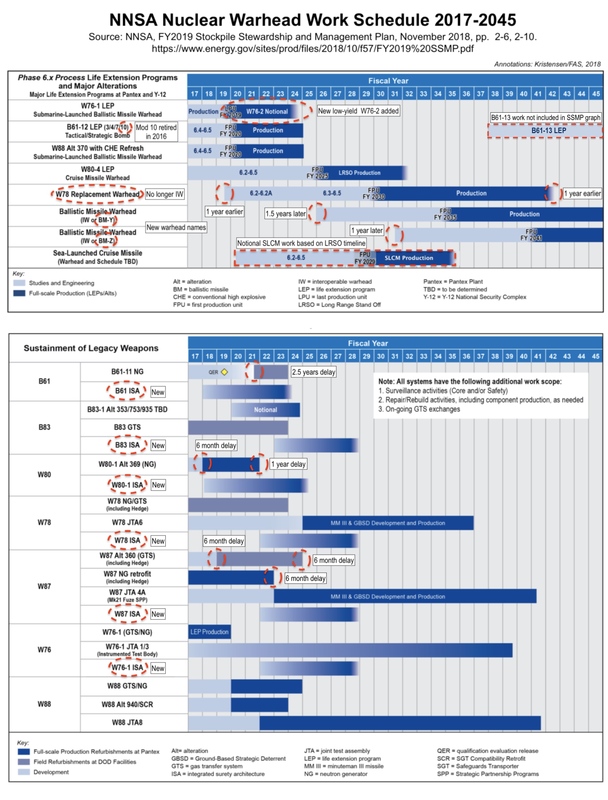 Altogether, the warhead LEP and legacy graphs show a very ambitious workload for the nuclear weapons complex. At some point in the early-2020s, as many as six different warheads LEPs would be in development or production at the same time, in addition to sustainment of legacy warheads in the stockpile. Although the NPR and SSMP both indicate the B61-12 is the replacement, they leave some uncertainty by talking about retaining the B83-1 “until a suitable replacement is identified.” The two weapons are used to hold at risk hard irregular and underground targets, and the B61-12 has increased accuracy and appears to have some limited earth-penetration capability. But the language used in the NPR and SSMP about the need to identify a “suitable replacement” could potentially indicate that the B61-12 may not be sufficient and that plans for a new weapon are underway. 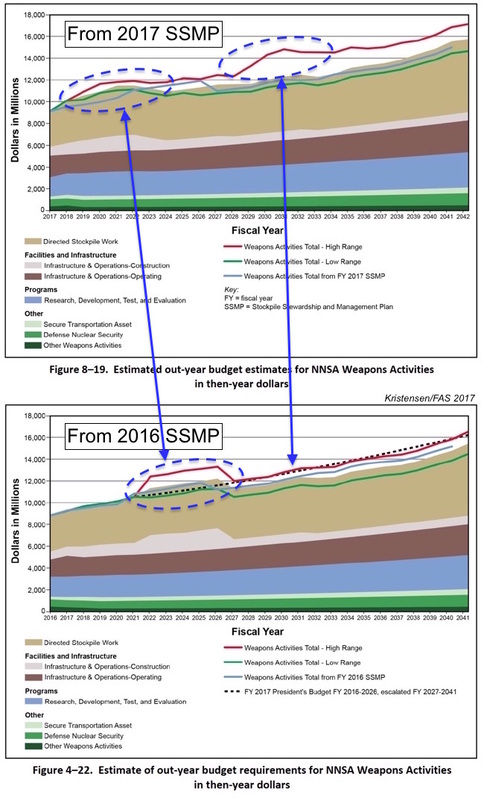 The projected cost increases shown in NNSA’s FY2019 SSMP, and plans to add two new nuclear weapons to the arsenal, are likely to significantly strain the capacity of the U.S. nuclear weapons complex. After initially proclaiming its intension to significantly increase the defense budget in the years ahead, the Trump administration instead has announced a reduction of the FY2020 defense budget. The growing deficit and declining Federal revenues cause by the administration’s tax cuts are likely to further increase the budget pressure in the years ahead. Combined, these developments are likely to create significant risks for the U.S. nuclear weapons modernization program. Unfortunately, the NPR glosses over and belittles the cost challenge for the nuclear modernization program. Rather than blindly pushing forward with excessively ambitious programs that would likely force emergency adjustments over the next decade in response to budget pressures, it is essential that the administration and Congress proactively modify the modernization programs now to take into account the significant fiscal risks. The U.S. SSBN fleet conducted 27 nuclear deterrent patrols in 2017, but with a mysterious reduction in the Pacific. 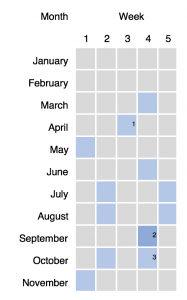 Click graph to view full size. Despite their age, U.S. nuclear ballistic missile submarines (SSBNs) continue to carry out strategic deterrent patrols at a steady rate of around 30 patrols per year, according to data obtained from the U.S. Navy under the Freedom of Information Act (FOIA) by the Federation of American Scientists’ Nuclear Information Project. Yet the data shows the U.S. SSBN fleet conducted a total of 27 patrols in 2017 (five less than in 2016), the lowest number of patrols in as single year since the early-1960s when SSBN deterrent patrols began. Even so, the fluctuations are small, modern SSBNs patrol longer than 1960s SSBNs, and the overall patrol number has remained relatively steady for the past decade. Nonetheless, the new data reveals a mysterious reduction of deterrent patrols in the Pacific in 2017: a nearly one-third drop from the 2016 level of 19 patrols to only 13 in 2017. The drop in Pacific patrols in 2017 happened despite completion of a second Explosive Handling Wharf at the Kitsap-Bangor Submarine Base that same year, which is intended to allow for additional maintenance needed as the submarines get older. 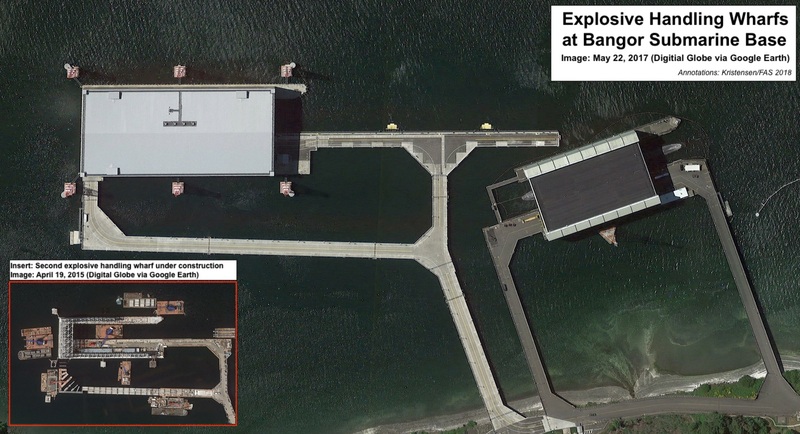 The drop in Pacific SSBN patrols happened despite completion of a second explosive handling wharf at Bangor. Click on image to view full size. It is unknown what has caused the Pacific reduction. 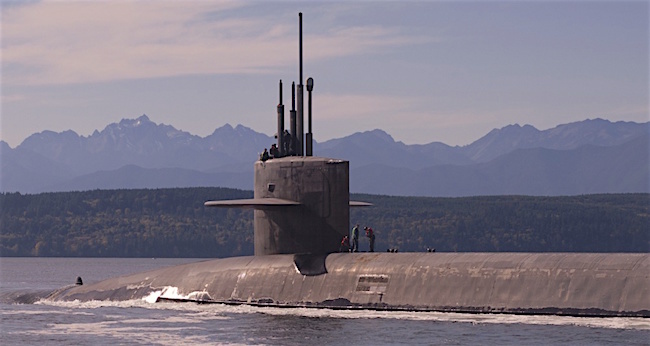 The size of the SSBN fleet at Kitsap-Bangor Submarine Base hasn’t changed, the Navy and U.S. Strategic Command haven’t announced a change in strategy, and there has been no public reports about serious technical problems that could have forced the reduction. In any case, the SSBN fleet appears have picked up some patrol slack in early-2018. In mid-March this year, the Navy told Congress that SSBNs “conducted 33 strategic deterrent patrols…over the past year,” or five more than the 27 patrols the FOIA release says were conducted through 2017. Coinciding with the reduction in Pacific patrols, the smaller Atlantic SSBN fleet (6 boats versus 8 in the Pacific) increased its patrols slightly in 2017 (from 13 to 14). As a result, the Atlantic SSBNs in 2017 conducted more deterrent patrols than the Pacific SSBN fleet for the first time since 2005 (14 patrol versus 13 patrols, respectively) when the majority of the SSBN force was shifted to operations in the Pacific. Altogether, between 1960 and 2017, the US SSBN fleet conducted a total of 4,083 deterrent patrols, which adds up to an average of just over three patrols per submarine per year. The Navy occasionally announces in public when SSBNs complete deterrent patrols, and less frequently when they begin a patrol. But it far from announces all of them. During the past decade, for example, only about one-third of the annual patrols were announced on average. The duration of SSBN patrols can vary considerably. The Ohio-class SSBN is designed for 70-day patrols but individual patrols can be cut short by technical difficulties, in which case another submarine will have to take over the assignment. Similarly, sometimes a submarine approaching the end of its scheduled patrol will be forced stay out longer cause the submarine that was supposed to replace it delayed by technical problems. In 2014, for example, the USS Pennsylvania (SSBN-735) stayed out for 140 days – more than four-and-a-half months or twice its normal patrol duration – because of maintenance problems with its replacement submarine. The Navy said it was the longest patrol ever conducted by an Ohio-class SSBN. Again, toward the end of 2017, the USS Pennsylvania stayed on patrol for 116 days. The USS Pennsylvania (SSBN-735) arrives at Kitsap-Bangor Submarine Base on June 14, 2014, after a 140-day deterrent patrol – the longest ever for an Ohio-class SSBN. Click image to view full size. The USS Pennsylvania was commissioned in September 1989 – 29 years ago – and completed a mid-life complex reactor refueling overhaul in 2012. The boat is scheduled to be retired in 2031 at age 42, the year the first new Columbia-class (SSBN-826) will sail on its first deterrent patrol. The 14 Ohio-class SSBNs will start retiring in 2027 and be replaced by 12 Columbia-class SSBNs from 2031. During much of the 2020s, the Navy will have more deployable SSBNs than it needs. 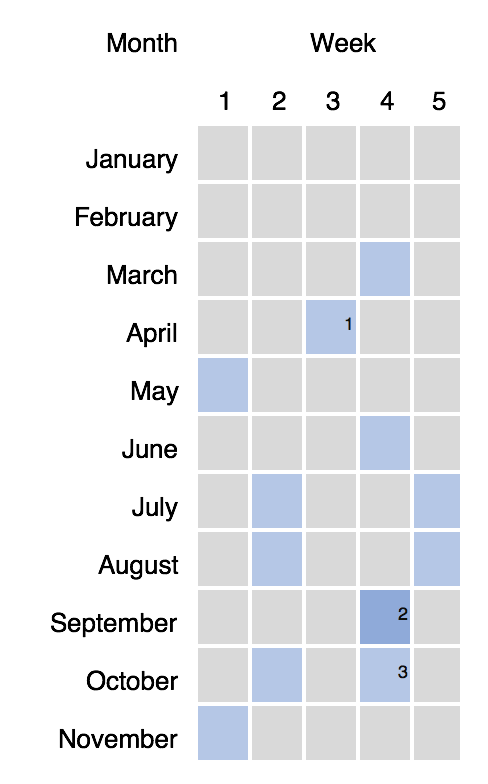 Click graph to view full size. Of the Navy’s 14 Ohio-class SSBNs, 12 are considered deployable (the 13th and 14th boats are in refueling overhaul). Of those, an average of 8-9 are normally at sea, of which 4-5 are thought to be on “hard alert” within range and position of their priority target strike package. The deployed SSBN force normally carries just over 200 SLBMs with around 900 warheads. Another 1,000 SLBM warheads are in storage for potential upload if necessary. The last two SSBN reactor refueling overhauls will be completed in 2020-2021, after which the Navy will be operating 14 deployable SSBNs, or two more than it needs for deterrent operations. At that point, the two oldest SSBNs – USS Henry M. Jackson (SSBN-730) and USS Alabama (SSBN-731) – can probably be retired. This publication was made possible by generous grants from the John D. and Catherine T. MacArthur Foundation, Ploughshares Fund, and the Carnegie Corporation of New York. The statements made and views expressed are solely the responsibility of the author. Seven years after the New START treaty between Russia and the United States entered into force in 2011, the treaty entered into effect on February 5. The two countries declared they have met the limits for strategic nuclear forces. At a time when relations between the two countries are at a post-Cold War low and defense hawks in both countries are screaming for new nuclear weapons and declaring arms control dead, the achievement couldn’t be more timely or important. The declarations show that Russia and the United States currently deploy a combined total of 2,794 warheads on 1,179 deployed strategic launchers. An additional 400 non-deployed launchers are empty, in overhaul, or awaiting destruction. Compare that with the same categories in 2011: 3,337 warheads on 1,403 deployed strategic launchers with an additional 586 non-deployed launchers. In other words, since 2011, the two countries have reduced their combined strategic forces by: 543 deployed strategic warheads, 224 deployed strategic launchers, and 186 non-deployed strategic launchers. These are modest reductions of about 16 percent over seven years for deployed forces (see chart below). The Russian statement reports 1,444 warheads on 527 deployed strategic launchers with another 392 non-deployed launchers. That means Russia since 2011 has reduced its deployed strategic warheads by 93, or only 6 percent. The number of deployed launchers has increased a little, by 6, while non-deployed launchers have declined by 80, or 24 percent (see chart below). The Russian numbers hide an important new development: In order to meet the New START treaty limit, the warhead loading on some Russian strategic missiles has been reduced. The details of the download are not apparent from the limited data published by Russia. I am currently working on developing the estimate for how the download is distributed across the Russian strategic forces. The analysis will be published in a subsequent blog, as well in our next FAS Nuclear Notebook and in the 2018 SIPRI Yearbook. The US statement lists 1,350 warheads on 652 deployed strategic launchers, and 148 non-deployed launchers. That means the United States since 2011 has reduced its deployed strategic warheads by 450, or 25 percent. The number of deployed launchers has been reduced by 230, or 26 percent, while the number of non-deployed launchers had declined by 94, or 39 percent (see chart below). 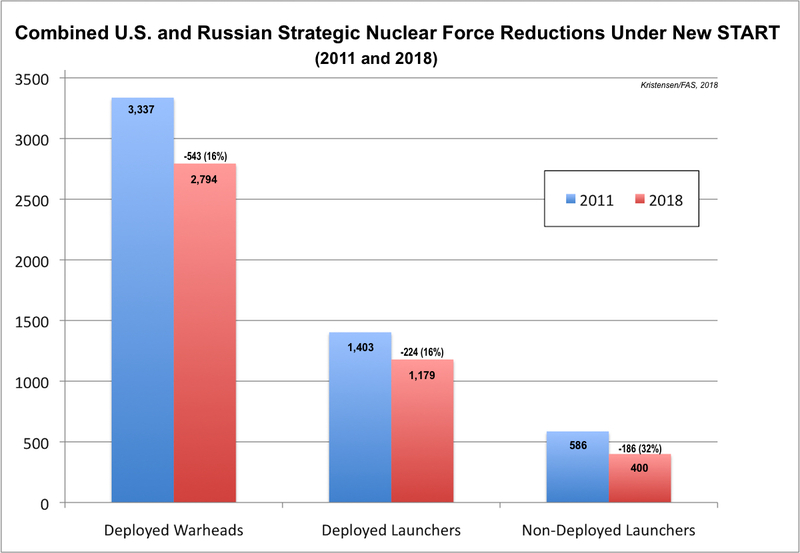 The reason for the different reductions is, of course, that the United States in 2011 had significantly more warheads and launchers deployed than Russia. During the New START negotiations, the US military insisted on a higher launcher limit than proposed by Russia. So while Russia by the latest count has 94 deployed warheads more than the United States, the United States enjoys a sizable advantage of 125 deployed strategic launchers more than Russia. Those extra launchers have a significant warhead upload capacity, a potential treaty breakout capability that Russian officials often complain about. So despite the importance of the New START treaty and its achievements, not least its important verification regime, the declared numbers are a reminder of how far the two nuclear superpowers still have to go to reduce their unnecessarily large nuclear forces. Ironically, because the US military insisted on a higher launcher limit, Russia could – if it decided to do so, although that seems unlikely – build up its strategic launchers to reduce the US advantage, and still be in compliance with the treaty limits. The United States, in contrast, is at full capacity. But the apparent download of warheads on Russia’s strategic missiles demonstrates an important effect of New START: It actually keeps a lid on the strategic force levels. Still, not to forget: The deployed strategic warhead numbers counted under New START represent only a portion of the total number of warheads the two countries have in the arsenals. We estimate that the deployed strategic warheads declared by the two countries represent on about one-third of the total number of warheads in their nuclear stockpiles (see here for details). This all points to the importance of the two countries agreeing to extend the New START treaty for an additional five years before it expires in 2021. Neither can afford to abandon the only strategic limitations treaty and its verification regime. Failing this most basic responsibility would, especially in the current political climate, remove any caps on strategic nuclear forces and potentially open the door to a new nuclear arms race. The warning signs are all there: East and West are in an official adversarial relationship, increasing military posturing, modernizing and adding nuclear weapons to their arsenals, and adjusting their nuclear policies for a return to Great Power competition. The symbolic importance of New START could not be greater! The full unclassified New START treaty data set released by State Department yesterday shows that the US reduction of its nuclear forces to meet the treaty limit had been completed by September 1, 2017, more than four months early before the deadline next month on February 5, 2018. The data set reveals details about how the final reduction was achieved (see below). Unfortunately, no official detailed data is released about the Russian force adjustments under New START. Our previous analysis of the overall September 1, 2017 New START data is available here. During that six-month period last year, 20 ballistic missile submarine launch tubes were deactivated, corresponding to four tubes on five Ohio-class submarines. Two of those submarines were in drydock for refueling and not part of the operational force. In total, the United States has deactivated 56 strategic missile submarine launch tubes since the New START treaty went into effect in 2011, although the first reduction didn’t begin until after September 2016 – more than five years into the treaty. The USS Louisiana (SSBN-743) returns to Kitsap Submarine Base in Washington on October 15, 2017 after a deterrent patrol in the Pacific Ocean. The submarine carried 20 Trident II missiles with an estimated 90 nuclear warheads. Of the 280 submarine launch tubes, only 212 were counted as deployed with as many Trident II missiles loaded. The treaty counts a missile as deployed if it is in a launch tube regardless of whether the submarine is deployed at sea. The United States has declared that it will not deploy more than 240 missiles at any time. Assuming each deployed submarine carries a full missile load, the 212 deployed missiles correspond to 10 submarines fully loaded with a total of 200 missiles. The remaining 12 deployed missiles were onboard one or two submarines loading or offloading missiles at the time the count was made. The data shows that the 212 deployed missiles carried a total of 945 warheads, or an average of 4 to 5 warheads per missile, corresponding to 70 percent of the 1,344 deployed warheads as of September 1, 2017 (the New START count was 1,393 deployed warheads, but 49 bombers counted as 49 weapons don’t actually carry warheads, leaving 1,344 actual warheads deployed). If fully loaded, the 240 deployable SLBMs could carry nearly 2,000 warheads. The Navy has begun replacing the original Trident II D5 missile with an upgraded version known as Trident II D5LE (LE for life-extension). The upgraded version carries the new Mk6 guidance system and the enhanced W76-1/Mk4A warhead (or the high-yield W88-0/Mk5). In the near future, according to the Trump administration’s Nuclear Posture Review (NPR), some of the missiles would be equipped with a low-yield version of the W76-1. The Navy is developing a new fleet of 12 Columbia-class missile submarines to begin replacing the Ohio-class SSBNs in the late-2020s. The Trump NPR states that “at least” 12 will be built. Each Columbia-class SSBN, the first of which will deploy on deterrent patrol in 2031, will have 16 missile tubes for a total of 192, a reduction of one-third from the current number of SSBN tubes. Ten deployable boats will be able to carry 160 Trident II D5LE missiles with a maximum capacity of 1,280 warheads; normally they will likely carry about the same number of warheads as the current force, with an average of about 5 to 6 warheads per missile. The New START data shows the United States now has just under 400 Minuteman III ICBMs in silos, down from 405 in March 2017. Normally the Air Force strides to have 400 deployed but one missile was undergoing maintenance. A Minuteman III ICBM is removed from its silo at F.E. Warren AFB on June 2, 2017, the last to be offloaded to bring the United States into compliance with the New START treaty limits. Although the number of deployed ICBMs had declined from 450 to 400, the total numbers of missiles and silos have not. The data shows the Air Force has the same number of missiles and silos as in March 2017 because 50 empty silos are “kept warm” and ready to load 50 non-deployed missiles if necessary. Reduction of deployed ICBMs started in 2016, five years after the New START was signed. And the actual ICBM force is the same size as when the treaty was signed. The 399 deployed ICBMs carried 399 W78/Mk12A or W87/Mk21 warheads. Although normally loaded with only one warhead each, the Trump NPR confirms that “a portion of the ICBM force can be uploaded” if necessary. We estimate the ICBM force has the capacity to carry a maximum of 800 warheads. An ICBM replacement program is underway to build a new ICBM (programmatically called Ground Based Strategic Deterrent) to begin replacing the Minuteman III from 2029. The new ICBM will have enhanced penetration and warhead fuzing capabilities. The New START data shows the US Air Force has completed the denuclearization of excess nuclear bombers to 66 aircraft. This includes 20 B-2A stealth bombers for gravity bombs and 46 B-52H bombers for cruise missiles. Only 49 of the 66 bombers were counted as deployed as of September 1, 2017. Another 41 B-52Hs have been converted to non-nuclear armament such as the conventional long-range JASSM-ER cruise missile. The New START treaty counts each of the 66 bombers as one weapon even though each B-2A can carry up to 16 bombs and each B-52H can carry up to 20 cruise missiles. We estimate there are nearly 1,000 bombs and cruise missiles available for the bombers, of which about 300 are deployed at two of the three bomber bases. The first B-52H bomber was denuclearized under New START in September 2015. Denuclearization of excess nuclear bombers was completed in early 2017. The bomber force was the first leg of the Triad to begin reductions under New START, starting with denuclearization of the (non-operational) B-52Gs and later excess B-52Hs. The first B-52H war denuclearized in September 2015 and the last of 41 in early 2017. Despite the denuclearization of excess aircraft, however, the actual number of bombers assigned nuclear strike missions under the strategic war plans is about the same today as in 2011. A new heavy bomber known as the B-21 Raider is under development and planned to begin replacing nuclear and conventional bombers in the mid-2020s. The B-21 will be capable of carrying both the new B61-12 guided nuclear bomb and the new LRSO nuclear cruise missile. The Air Force wants at least 100 B-21s but can only make 66 nuclear-capable unless it plans to exceed the size of the current nuclear bomber force. With the completion of the force reductions under New START in preparation for the treaty entering into effect on February 5, 2018, the attention now shifts to what Russia and the United States will do to extend the treaty or replace it with a follow-up treaty. With its on-site inspections and ceilings on deployed and non-deployed strategic forces, extending New START treaty for another five years ought to be a no-brainer for the two countries; anything else would increase risks to strategic stability and international security. If the treaty is allowed to expire in 2021, there will be no – none! – limits on the number of strategic nuclear forces. Unfortunately, right now neither side appears to be doing anything except to blame the other side for creating problems. It is time for Russia and the United States to get out of the sandbox and behave like responsible states by agreeing to extend the New START treaty. February 5 – when the treaty enters into effect just 23 days from now – would be a great occasion for the two countries to announce their decision to extend the treaty. As the Trump administration has prioritized North Korea, it has expanded military exercises around the peninsula to attempt to coerce the regime and assure US allies in Seoul and Tokyo. Perhaps the most dependable signal has been B-1B bombers missions to allied airspace. Though the flights were staged regularly during the Obama administration, they have become more frequent over the last year and more assertive. A review of official press releases and public reporting places this week’s flight of a conventional B-1B bomber near the Korean peninsula as the thirteenth of 2017. The B-1B bomber originally entered service in 1986 as a supersonic nuclear bomber intended to serve as an interim step between the aging B-52 and the stealthy B-2. The B-1B’s nuclear mission was eliminated in 1994, after which the Air Force did not expend money to maintain its nuclear certification. To meet its obligations under the START treaties, the B-1B was converted to a conventional only platform by welding a metal sleeve onto the aircraft to prevent installation of cruise missile pylons and by removing cable connections in the weapon bays necessary to arm nuclear munitions. As part of New START, Russian observers inspected these modifications in 2011 and accepted the bomber as nonnuclear. Though effectively nonnuclear, the regional perception of the B-1B is more nuanced. South Korea regularly refers to these flights as demonstrating “strategic assets,” a term usually applied to nuclear-capable platforms. By allowing the term to refer to the intercontinental range of the aircraft in this context, the United States mollifies South Korean officials who desire frequent signals of the US nuclear commitment without devaluing their nuclear signaling options. Perceptions of the flights are additionally complicated by the fact that North Korea regularly refers to the B-1B as a nuclear platform. For example, North Korea decried this week’s flight a “nuclear strike drill.” Whether they do so for propaganda purposes or genuinely believe the aircraft is nuclear-capable is not clear, but defense strategists must consider the possibility that Pyongyang perceives a nuclear signal, even if the US officials did not intend to send one. What is clear is that the B-1B flights are of particular concern for Pyongyang. In August, 2017, state propaganda agency KCNA described “the operational plan for making an enveloping fire at the areas around Guam” by firing four Hwasong-12 IRBMs as a way of “containing” B-1B flights. The threat was an early attempt to brandish North Korea’s new long-range missiles in an attempt to coerce the US-South Korea alliance to modify its deterrent posture. The missions are meant to ensure interoperability with allied forces and reassure allies of US defense commitments. US defense observers now widely doubt that the missions have any deterrent value and have instead become essentially routine signals of assurance to South Korea. North Korea now expects that any major test or provocation will elicit a B-1B flight in response. The assurance value of the flights is also an open question. Though ROK officials appreciate the signal, in the wake of the North Korean ICBM and thermonuclear weapons tests, they have also reportedly sought explicit signals of the US nuclear commitment as well as new conventional military signals. As such, the flights now probably have limited value to the alliance and several observers suggest that they could be modified if North Korea proved willing to negotiate tensions reductions measures. The most common mission profile has been “sequenced bilateral” missions in which usually two B-1Bs depart Guam, operate with Japan Air Self-Defense Force (JASDF) fighters near Japan (often near Kyushu), then subsequently with Republic of Korea Air Force (ROKAF) fighters. About half the time, the bombers perform a simulated release of munitions or, as in (July, August, and September) release live or inert munitions onto Pilsung range, South Korea. In September and October, the Air Force has begun to experiment with provocative new mission profiles. On 30 August, the B-1Bs were escorted for the first time by USMC F-35B aircraft from MCAS Iwakuni, Japan. The combination of the stealth fighter with the low-observable bomber will raise new concerns in Pyongyang about the abilities of their air defenses to detect and aerial intrusions. On 23 September, a B-1B mission for the first time flew Northeast of the Demilitarized Zone in international airspace. According to the US Air Force, North Korean air defenses failed to detect the flight, raising additional concerns about their capabilities. On 11 October, CNN reported that a sequenced bilateral mission had performed a missile release drill in the East Sea (Sea of Japan), following which the B-1Bs and their ROKAF escorts crossed the peninsula and repeated the drill in the West Sea (Yellow Sea). Though B-1B exercises in the West Sea are not unprecedented, they are highly unusual. Additionally, this is the first known report of a missile release drill. The only missiles carried by the B-1B are the standard and extended-range variants of the Joint Air-to-Surface Standoff Munition, a long-range conventional cruise missile. Using the unclassified range of 500 miles, the JASSM-ER is capable of striking Chinese territory from most points in the East Sea and all of the West Sea. Beijing can be struck from the western half of the West Sea without flying north of the DMZ. This fact, combined with the proximity of the flight with US-ROK naval exercises in the West Sea around the time of the landmark Chinese Party Congress, suggests that the flight was an assertive signal not only to Pyongyang but also to Beijing. Though B-1B sequenced bilateral missions are now essentially routine, several trends raise the risk that these flights could contribute to military escalation. This year’s B-1B flights occur in a political and military context distinct from previous administration. The Trump administration has through rhetorical comments and assertive military signaling around the peninsula has signaled that they could order military strikes on North Korea. In the last two weeks, the US-ROK combined forces have staged a series of highly provocative exercises ahead of Mr. Trump’s visit to the region (including major live fire naval exercises in the East and West Seas, drills to evacuate US civilians, port visits from American submarines and the USS Ronald Reagan aircraft carrier, and announcements of upcoming deployments of F-35A to Japan and a three-carrier exercise in the Pacific). Both in exercises and in other announcements, both the United States and South Korea have openly signaled that they are training for decapitation strikes against North Korea’s leadership. The signal is intended to convey to Pyongyang that ordering an attack could place their lives directly at risk and so to deter aggression. Yet, the administration’s rhetorical emphasis on forcible denuclearization of the peninsula may also give the impression that the United States could carry out assassination strikes even absent North Korean aggression. Combined with poor situational awareness of low-observable aircraft, the statements significantly raise North Korea’s incentives to escalate any crisis, the likelihood that they perceive US operations as a prelude to attack, and the risk of nuclear use. To date, the Trump administration has not conducted a flight of a nuclear-capable B-2 stealth bomber to Korea. In 2013, the Obama administration did carry out a prominent flight from Whiteman AFB, MO to deliver inert munitions at Pilsung, the first and last time a B-2 mission has been disclosed publicly. However, on 28-29 October, 2017, a B-2 flew from Whiteman to an undisclosed location in the Pacific. The bomber reportedly stopped on Guam, where it swapped crews with the engines running. Though a B-2 flight to Korea is unlikely to be radically destabilizing, in the context of a frequent White House comments playing up the possibility of military action and thinly-veiled nuclear threats to North Korea, planners should be aware that dispatching a B-2 is likely to be significantly more provocative than similar missions in previous years. In the past, the United States had generally conducted Bomber Assurance and Deterrence (BAAD) flights with B-52 bombers. Because some B-52s are nuclear-capable, these missions were widely interpreted as nuclear deterrent signals. The most recent B-52 flight was in January, 2016, following the fourth DPRK nuclear test. Since 2004, either B-1B, B-52, or B-2 bombers have been rotationally stationed in Guam as part of the “Continuous Bomber Presence” Mission. In 2003, 12 B-52s and 12 B-1B bombers were alerted in the United States and subsequently deployed to Guam after 4 North Korean MiG fighters intercepted an American surveillance plane. Lastly, the missions may be sending precisely the opposite message from the one intended. For the last several years, the United States has continued to work to improve trilateral coordination between the United States, South Korea, and Japan in order to present North Korea with a united front. However, the sequenced bilateral missions only serve underscore the reticence of the ROKAF and JASDF to operate together. 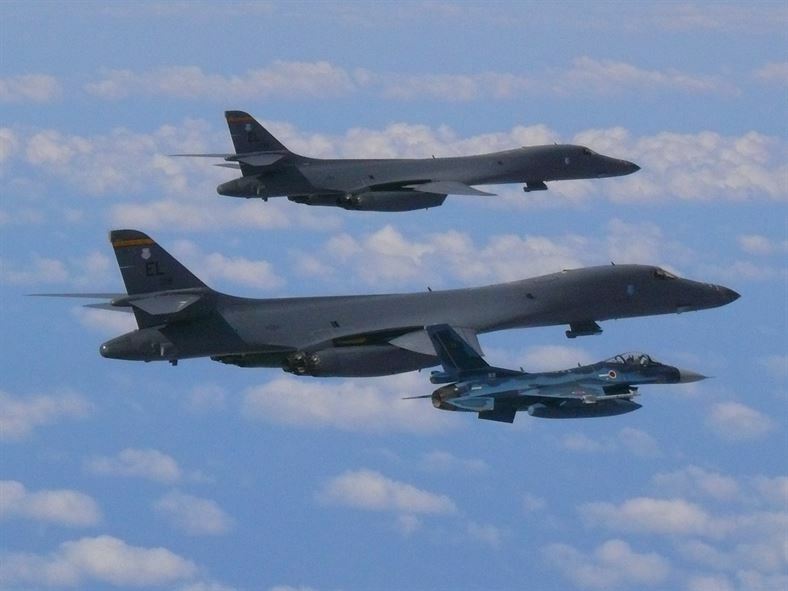 Though JASDF fighters sometimes “hand off” the US bombers to ROK pilots, trilateral missions would send a far stronger signal of cohesion and capability, especially if conducted over ROK airspace. These considerations raise serious questions about the value of B-1B assurance flights. At a time of rapid advance in North Korea’s nuclear and missile capabilities, with a US leadership that has made statements exacerbating South Korea’s concerns that the United States could decouple from its allies, it is unlikely that routine and symbolic flights are an effective signal either for deterring Pyongyang or assuring Seoul. Image: https://www.facebook.com/lowapproach/posts/1468961693225121. Hat tip: Roel Stynen. NATO reportedly has quietly started its annual Steadfast Noon nuclear strike exercise in Europe. This is the exercise that practices NATO’s nuclear strike mission with dual-capable aircraft (DCA) and the B61 tactical nuclear bombs the US deploys in Europe. In addition to nuclear-capable aircraft from Belgium, Germany, Italy and the Netherlands, local spotters have also seen Czech Gripens and Polish F-16s. The United States will likely also participate with either F-16s from Aviano AB in Italy or F-15Es from RAF Lakenheath in England. The non-nuclear aircraft from Czech Republic and Poland are participating under NATO’s so-called SNOWCAT (Support of Nuclear Operations With Conventional Air Tactics) program, which is used to enable military assets from non-nuclear countries to support the nuclear strike mission without being formally part of it. Polish F-16s have participated several times before, including in the Steadfast Noon exercise held at Ghedi AB in Italy in 2010. This year’s Steadfast Noon exercise is taking place at two locations: Kleine Brogel Air Base in Belgium and Buchel Air Base in Germany. Both bases store an estimated 20 US B61 nuclear bombs for use by the national air forces. This is the second year in a row that the exercise has been spread across two bases in two countries. Last year’s exercise was held at Kleine Brogel AB (Belgium) and Volkel AB (Netherlands). The multi-base Steadfast Noon exercises are often coinciding with or preceding/following other exercises such as Decisive North and Cold Igloo. 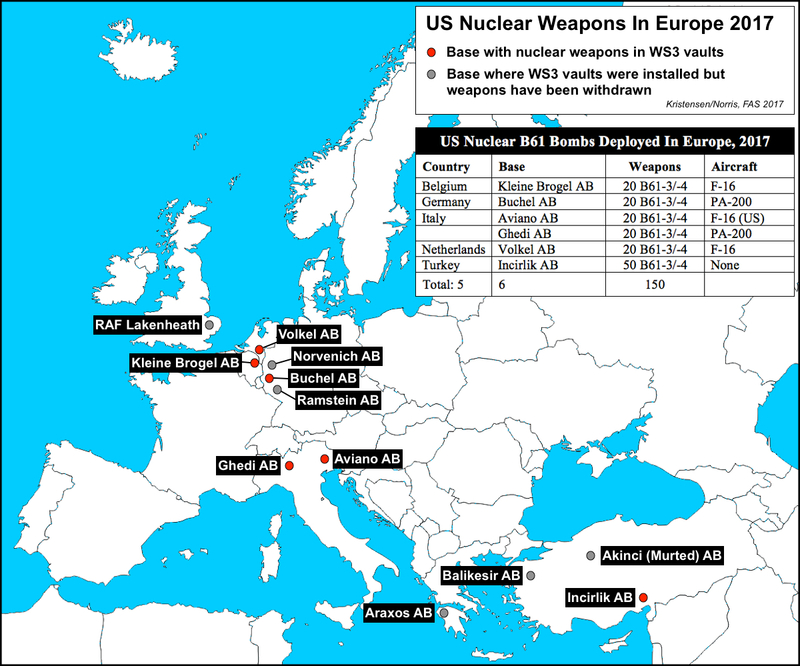 There are currently an estimated 150 B61 bombs deployed at six bases in five European countries (see figure below). Weapons were previously also deployed at RAF Lakenheath but withdrawn sometime between 2004 and 2008. Weapons were also withdrawn from Araxos AB (Greece) in 2001. Consolidation (but not complete withdrawal) also happened in Germany and Turkey (for these earlier changes, see my report from 2005). In addition to the countries with nuclear-capable aircraft – Belgium, Germany Italy, Netherlands, Turkey (note that the status of Turkey’s nuclear role is unclear, but it’s F-16s are still nuclear-capable), and the United States, there will likely be participation from other NATO countries under the SNOWCAT program. NATO is adjusting its nuclear posture in reaction to the new adversarial relationship with Russia. The Trump administration’s Nuclear Posture Review is expected to reaffirm the continued deployment and modernization of US non-strategic nuclear weapons in Europe. But there is a push from hardliners inside NATO to increase the readiness and planning for the non-strategic aircraft. Others say it is not necessary. Last month several B-52 bombers forward-deployed to Europe in support of NATO and many see that as sufficient signaling at the nuclear level. Overall, moreover, NATO’s reaction to Russia is focused on providing non-nuclear defense to Europe. In a broader context, the nuclear exercise has not been officially announced and NATO is very tight-lipped about it because of the political sensitivity of this mission in mainly western NATO countries. The secrecy of the exercise is interesting because NATO only a few weeks ago complained that Russia was not being transparent about its Zapad exercise. Seems like both sides could do better.